Despite getting to bed so early, I didn’t wake up until 8:30 the next morning. I lay in the sleeping bag for some time, not wanting to leave its comfort and warmth. Finally, I willed myself to get up, let Muffin out to go to the bathroom, and started boiling water on the stove for breakfast. The fuel was cold, and the stove flared momentarily, then settled down to a steady blue flame. The propane/butane mixture didn’t fare well at this temperature, and it took longer than usual to boil a pot of water. During the night, the weather had changed significantly. The sky was no longer clear, replaced by an ominous gray pall. The wind had picked up, whistling in the treetops and gusting up above in the peaks. As of yet, no one had come by; we still had the mountain to ourselves. But I had a decision to make. Should we continue on to Mizpah Hut and Mt Jackson, or call it quits and get off the mountain before the predicted sleet and freezing rain arrived later in the day. Muffin in the tent on Saturday morning. The floor was a bit bumpy because I didn’t do a very good job of flattening down the area, but it was livable. 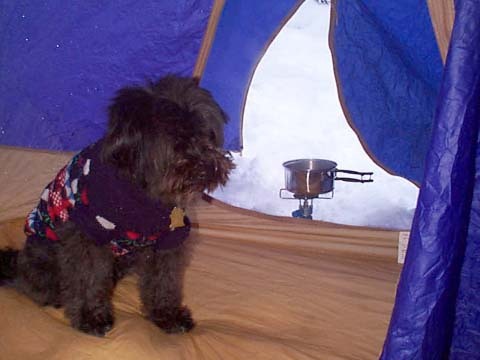 I cooked in the tent’s vestibule, melting and boiling snow to refresh our dwindling water supplies since there was no spring nearby and the creeks were all frozen. Self-portrait on the Crawford Path. Despite having to call it quits and head back down, the woods were still pretty and peaceful, and we enjoyed the winter scenery. Muffin and my pack on the trail on Saturday morning. 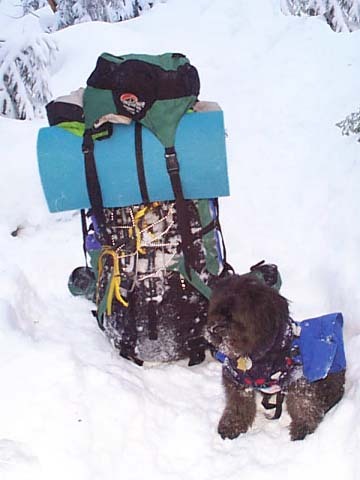 My pack had gained a good ten pounds overnight due to a frosty tent and damp sleeping bag and clothes. 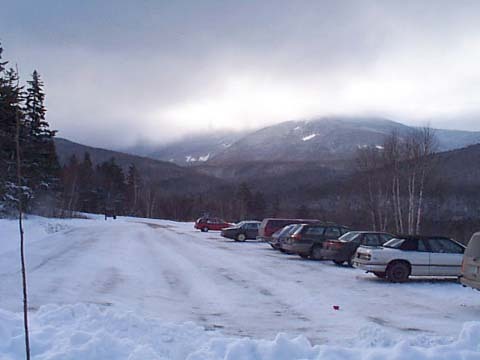 The Crawford Connector parking lot on Saturday. In the background, the clouds are obscuring the summit of Mt Willard, and most of Mts Avalon and Field in the Willey Range.